OK last day – I’ve brewed my last tea bag – there’s just a smidgeon of oatmeal left after today’s porridge and the milk’s gone. There is lentil soup for lunch with our peanut butter sandwiches, and the last slice of apple (I didn’t have any yesterday). We’re on the perilous approach to dinner. What we have are some lentils, tomato paste, some boiled potato, a tiny bit of cottage cheese, onion and garlic, 2 eggs and a carrot. And there’s still whole wheat flour, peanut butter and a hunk of sour dough bread. There are 2 tiny tangerines I was going to use to make muffins before realizing that we had no baking powder or baking soda. I always believed that cooking was more about doing something with what was available, than choosing a recipe, buying ingredients and following the instructions. What about something falafel-ish (no chick peas or seasoning, tomato sauce instead of yogurt, noodles instead of pita?) 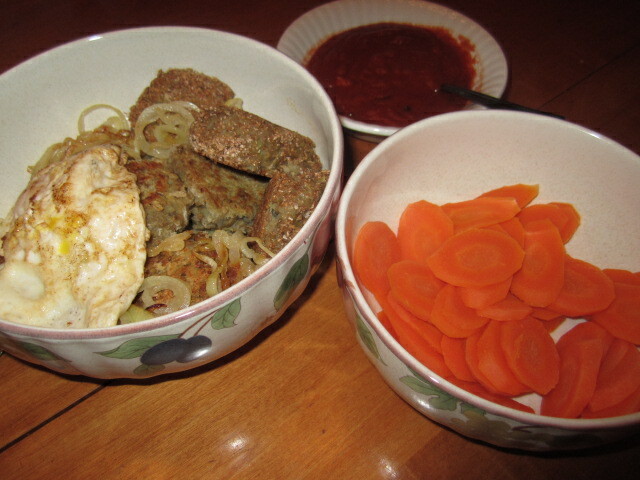 Now there’s no time for noodle-making, so its false falafels, with fried onions (the best part) one fried egg, tomato sauce and not-enough-steamed carrots. 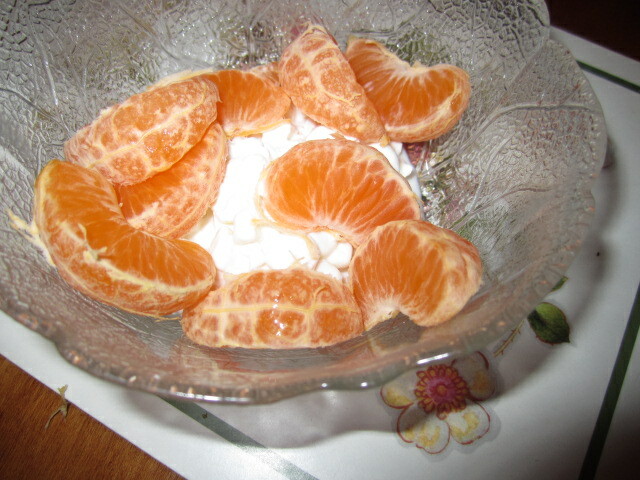 Followed by a small bowl of tangerine & cottage cheese. And we have leftovers! Three falafel balls. These are dense little concoctions leaving me feeling a bit bloated. Most useful ingredients were the lemon, the tomato paste, onion and garlic. Essential staples were eggs, peanut butter and whole wheat flour. Biggest deficit was fruits and vegetables, herbs and spices, and protein-rich foods. Biggest frustration was being unable to balance surpluses (flour) and deficits (a lot of things). Its difficult to buy quantities in small amounts, and of course, expensive. A food-buying club, food swap, co-op grocery or community kitchen approach might be helpful as long as outlays were kept small. Organizing and cooperating will be difficult for some people. Its especially hard when you realize you just can’t afford to economise.